The Egyptian-German archaeological mission operating in Matariya area discovered on Sunday two toes belonging to the statue of King Psamtik I, which was excavated in March, sources with the Antiquities Ministry told Al-Masry Al-Youm on Monday. The statue was mistaken for King Ramses II in March before the Antiquities Ministry announced it belonged to Psamtik I. The mission also found the statue’s pedestal made of limestone and bearing a hieroglyphic inscription, the sources added, pointing out that the pedestal was partially damaged by groundwater. The mission is keeping quiet on this discovery, hoping to find more remains of the statue, because finding the toes and the pedestal confirmed the possibility of finding the rest of the statue in the same place, according to the sources. The discovered parts so far represent 40 percent of the huge statue, said the sources. The excavated parts were transferred to the Egyptian Museum in Tahrir Square and will be transferred later to the Grand Egyptian Museum, said Antiquities Minister Khaled al-Anany. The statue belongs to King Psamtik I, and not Ramses II, Anany said, adding that Psamtik I belonged to the 26th Dynasty, and ruled Egypt for 54 years. 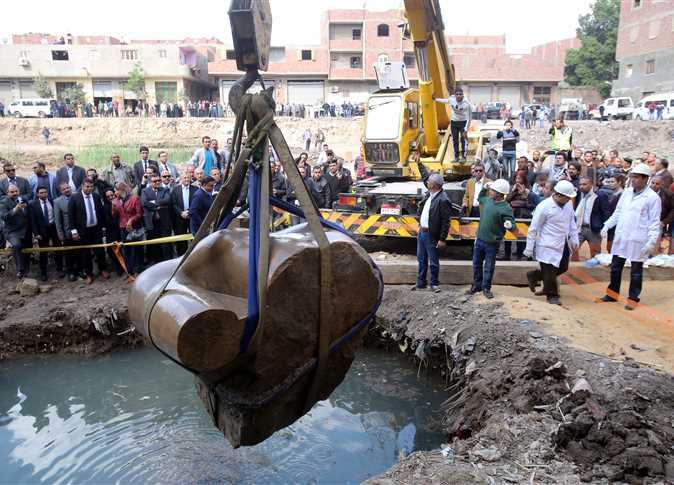 Parts of the eight-meter statue were found submerged in groundwater in the Matariya area in Ain Shams district at the location where King Ramses II is believed to have built his Temple, in a city called Oun in Ancient Egypt. The discovery included parts from two statues of two kings, one of who is King Psamtik I.
Anany said in March the discovery was one of the most important ones made in recent archaeological digs, as it demonstrates the greatness of the temple in ancient times in terms of the magnitude of the building and the statues that were adorned by fine, precise patterns and inscriptions.